Mommies and daddies, we know how tricky it is to keep your kids engaged without turning your home upside down. But what if they could run wild, play, learn, and indulge in some art at the same time? Sounds like a dream, doesn’t it? We found you play zones that have ball pools, inflatable slides, and activity corners. Plus, these places host birthday parties too. So, get here with your brats and watch them have fun. If you are a working parent and want to finish that report while your child is engaged and well taken care of, this is an ideal place for you. You can let your little one wander around the play area which has slides, ball pools, fun role-play stations, games and activity corners and several fun things. They also have a separate soft play area for toddlers. So, while your little one is having a gala time, you can utilise the time and the unlimited Wi-Fi to catch up with your pending work or curl up to a good book with a warm cup of coffee from the cafe. You can also avail the monthly membership at an exciting price and make this your and your child’s hangout spot. This jungle-themed play zone will bring out the inner Mowgli in your child. They can jump into the ball pool, slide up and down the colourful slides or walk through a hanging tunnel that leads them to a swing on the other side. So, let your child stay active and make some new friends in this play zone. You can add to their fun by throwing a birthday party inviting all their friends here too! Just book the place, select a package and choose the meal and let your kiddie and the friends experience the jungle themselves! While most play zones encourage your kids to play and enjoy, Plabo also encourages children to learn while they have fun. This one-of-a-kind play zone has two zones for kids- Playarium & Explorium, along with a cafe to keep their tummy full. Depending on the age and interest of your child you can choose the zone you want to send your kid to. The playarium is a fun zone with colourful swings and slides while the explorium is where your child’s creativity comes to play and they learn about how stuff works- from gravity to fluidity, whatever sails their boat! The next time your children get too curious, head over to Plabo for a play-date and let them experience it themselves. The place is open for birthday party bookings too. This fun corner understands your kids’ creative side and encourages it to create art at their art and craft centre. Once they are done getting their hands dirty with the paints and crayons, they can also head to the play area where a bunch of rides and swings await them. The centre also features a cafe to beat the hunger pangs with Italian, continental, and Chinese delicacies. This centre pays special attention to the kind of equipment used and ensures they are safe and sanitised. 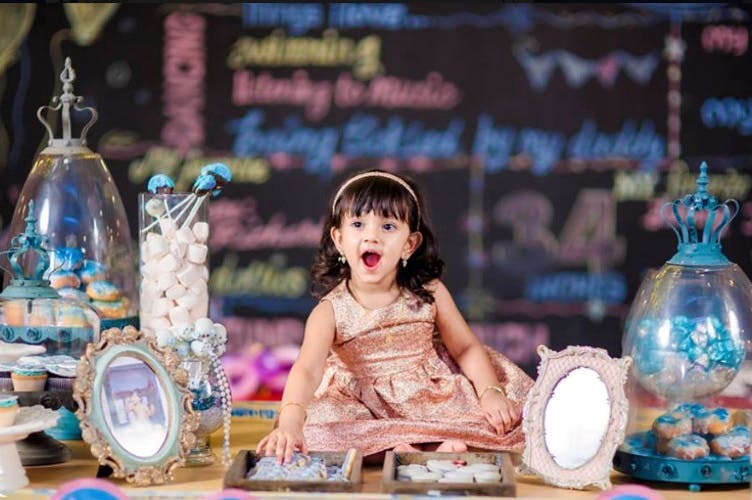 It is aesthetically designed keeping children in mind and specialises in cakes and desserts, which also makes it the perfect spot to throw a party for your little bundle of joy. As the name suggests, this play area has inflatable slides and obstacle courses for them kiddies. But that’s not all, the centre also features a petting zoo, where your child can interact with animals, birds and make new friends. They can have all the fun they want while they are supervised by the trained staff. It also offers a range of party packages for you to choose from. The menu is flexible; plus, the decorations and games are taken care of.